A teeny tiny glimpse of a bra may hardly be considered a wardrobe malfunction in the world of skin-flashing celebrities today but when you’re a royal it’s not quite, ahem, royal decorum. Meghan experienced an “awkward wardrobe malfunction” while attending the wedding of one of Prince Harry’s best friends – Charlie van Straubenzee to Daisy Jenks – in the village of Frensham, south-west of London, on Saturday, OK! reports. The former actress had supposedly left the top button of her stylish ensemble undone, which resulted in a flash of her black lace bra as she waved to well-wishers. 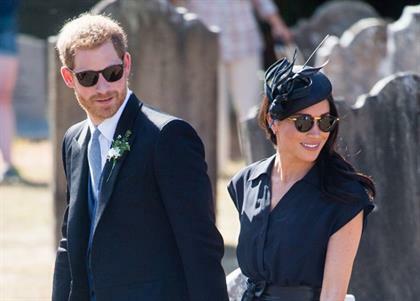 The Duchess of Sussex, who was also celebrating her 37th birthday that day, appeared to realise her faux pas and quickly readjusted her button-down shirt dress as she joined the other guests at the historic St Mary the Virgin church. Either way, the bra was the perfect accessory for her $700 (R9 354) navy Club Monaco dress which boasted panels of colour in the skirt, and which she teamed with a matching fascinator by Philip Treacy, according to People. Harry (33) meanwhile looked dapper in a morning suit in his reported role as best man for Charlie, a childhood friend, who was among his ushers at his wedding to Meghan in May. Interestingly Meghan shares a birthday with Harry’s great-grandmother, the late Queen Mother, who was born on 4 August in 1900. Last year she and Harry celebrated her birthday at a private getaway in Africa shortly before they announced their engagement.